America has been completely changed after a war destroyed the country. A wall was constructed, dividing the west and east sides of the country. The east side is full of people suffering from all kinds of mutations and some people are now more animal than human. Crossing the wall is considered forbidden, but some people sneak out to Fetch artifacts from the east. When Delaney Park’s father is nearly caught doing a Fetch and then disappears, she agrees to complete her father’s job in order to save his life. This book was fascinating!! The science nerd in me loved all of the talk of mutations and the way they were affecting each person. Lane encounters all sorts of different creatures and half-humans on her journey, each more incredible than the next. I also thought it was really cute how everyone names their children after the places that they miss from the eastern part of the country, for example–Delaney Park, Annapolis, and Orlando. Lane manages to make a deal with Rafe, a boy her age living in the Savage Zone. He agrees to help her with her father’s job but Lane is not entirely sure that she can trust him. At first I wasn’t crazy about Rafe but halfway through the book, he really grew on me. I really liked his interactions with Lane, especially once she realized that there was more to him than meets the eye. I was a bit surprised by the love triangle and it will definitely be interesting to see how that begins to resolve in book two. The world building in this book was excellent. I loved reading about the America beyond the wall even though it is extremely treacherous and scary. Little settlements have sprung up full of people with and without mutations, yet some entire cities are run by tyrants. It was interesting to read about life outside the safety of the wall and it was evident how much it really affected Lane to see the truth out there. Overall, Inhuman was an exciting original story that kept me turning pages. The ending was (of course) a major cliffhanger so I am anxiously awaiting the second book! 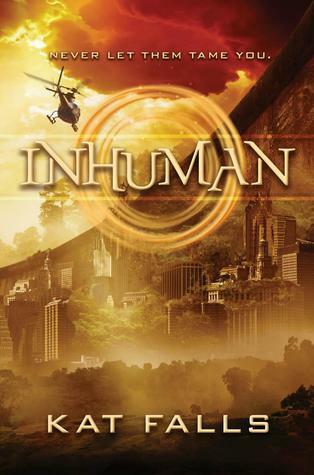 Inhuman was released September 24, 2013 and is the first book in the Fetch series.